The new Prius will be available in the market late February, with FWD and AWD-e in L Eco, LE, XLE, and Limited trim levels. With the 2019 Prius, you can confidently face the elements as you discover your own. The 2019 Prius gives you the power to help you brave the rain, snow, and dirt with the newly available AWD-e. This technologically advanced feature means more exploring with fewer concerns. And the classic front-wheel drive can help turn your everyday adventures into epic tales as you take advantage of impressive fuel efficiency. Prius serves your curiosity and encourages you to ride out your story. So let’s venture outside and into the unknown. Capable of more than just city commutes, Prius offers ample cargo space for your impromptu adventures or your calculated itineraries. If up to 27.4 cu. ft. of space with the seats up or 65.5 cu. 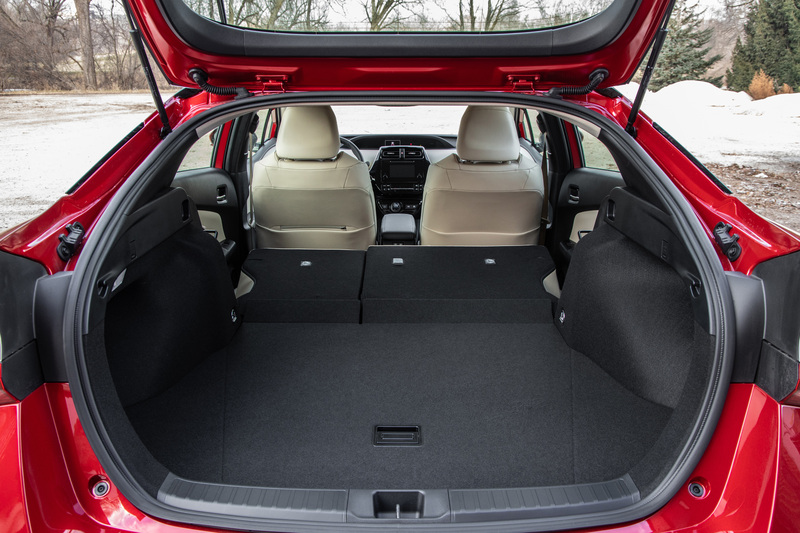 ft. with the seats folded isn’t enough to hold all your gear, 28 cargo cross bars are available to share the load. Seek out hidden gems—like that quiet surf spot or that bustling marketplace—in the 2019 Prius and be in your element. When it comes to the 2019 Prius, “Let’s Go Places” can be expanded to “let’s go more places, in more conditions” thanks to the available new AWD-e system. Designed to provide more confidence and control when weather and road conditions are less than ideal, the electric all-wheel-drive system further expands where Prius can take drivers. 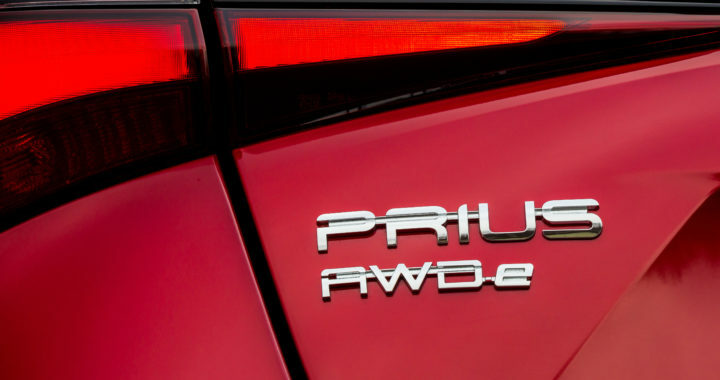 The new Prius AWD-e system will certainly deliver added traction and confidence for drivers but, in true Prius fashion, the 2019 AWD-e will lay claim to being one of the most fuel-efficient all-wheel-drive-equipped passenger cars available in the U.S., thanks to manufacturer-projected mpg estimates of 52 mpg city / 48 mpg highway / 50 mpg combined. 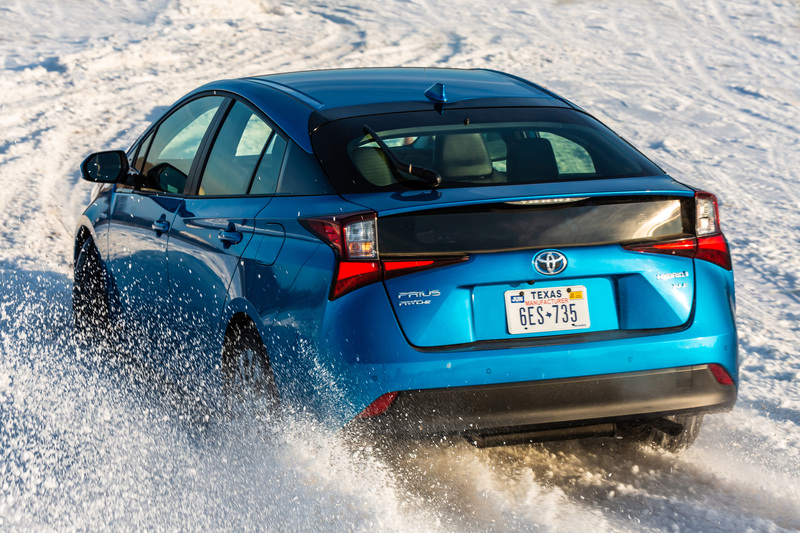 Toyota estimates that the AWD-emodel could account for as much as 25 percent of annual U.S. Prius sales. The AWD-e models rely on a Nickel-Metal Hydride (Ni-MH) battery since nickel batteries are inherently resilient to extreme temperature change. This provides AWD-e models with excellent battery performance in cold-weather conditions. All FWD Prius models will tout a Lithium-Ion battery. Full-Speed Range Dynamic Radar Cruise Control (DRCC). 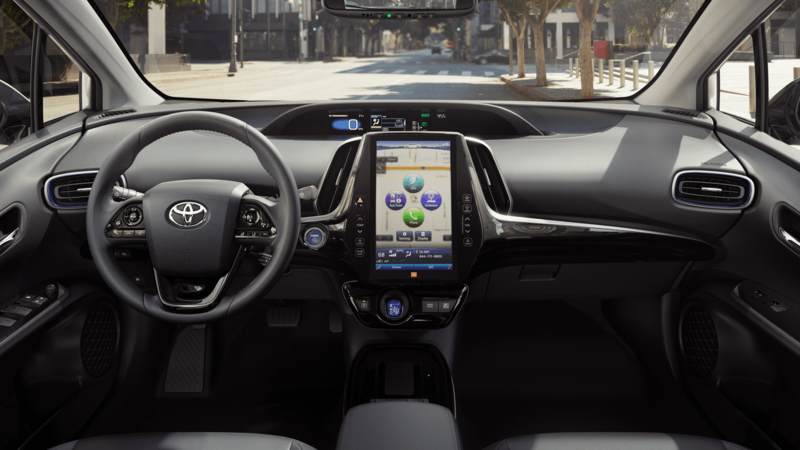 All Prius models share interior features including the familiar central screen interface. The 4.2″ color Dual Multi-Information Display with customizable screens adds an AWD-e system indicator to the menu of displays, which also includes Energy Monitor, Hybrid System Indicator and Eco Score, Eco Savings Record, Drive Monitor, Eco Wallet, Eco Diary, Climate Control, driver support systems, audio system content, and navigation system content. For the ultimate in high-tech information, the available Color Head-Up Display (HUD) shows the speedometer and Hybrid System Indicator in the driver’s line of sight. The standard Entune Audio system for AWD-e models includes the Entune Multimedia Bundle: 6.1 in. touch-screen display, AM/FM CD player, 6 speakers, auxiliary audio jack, one USB 2.0 port with iPod connectivity and two 2.1-amp USB charge ports, advanced voice recognition, Bluetooth hands-free phone capability, phone book access and music streaming Siri Eyes Free, and an integrated backup camera display. The Limited grade comes standard with the Entune Premium JBL Audio with Integrated Navigation and App Suite, with a large 11.6” HD multimedia display. The 2ZR-FXE 1.8-liter 4-cylinder gasoline engine is itself a paragon of high efficiency. Thanks to ultra-low internal friction and efficient combustion, it exceeds 40 percent thermal efficiency, which is among the highest in the world for a gasoline engine. The Prius gets a good share of its fuel efficiency by cheating the wind with an ultra-low 0.24 coefficient of drag (Cd), which is among the lowest of current production passenger cars. An automatic grille shutter reduces drag by closing when airflow to the radiator is not needed. Even the air conditioning system, which uses a quiet electric compressor, works intelligently to maximize energy efficiency. The Smart-flow (S-FLOW) mode directs airflow only to seated occupants to conserve energy and maximize comfort. Standard Bi-LED headlamps and LED rear combination lamps reduce energy consumption compared to halogens while giving better light and having a longer service life. A backup camera comes standard on all grades, and a full-width glass panel beneath the rear spoiler aids rearward visibility while also serving as a distinctive design feature. Posted in New Vehicles and tagged 2019 Prius AWD-e Release Date, 2019 Prius Battery, New Prius All-Wheel-Drive release date, Nickel-Metal Hydride (Ni-MH) battery, Northeast Ohio Auto Show, Prius AWD-e Battery Warranty, Prius AWD-e for sale in Cleveland Ohio.